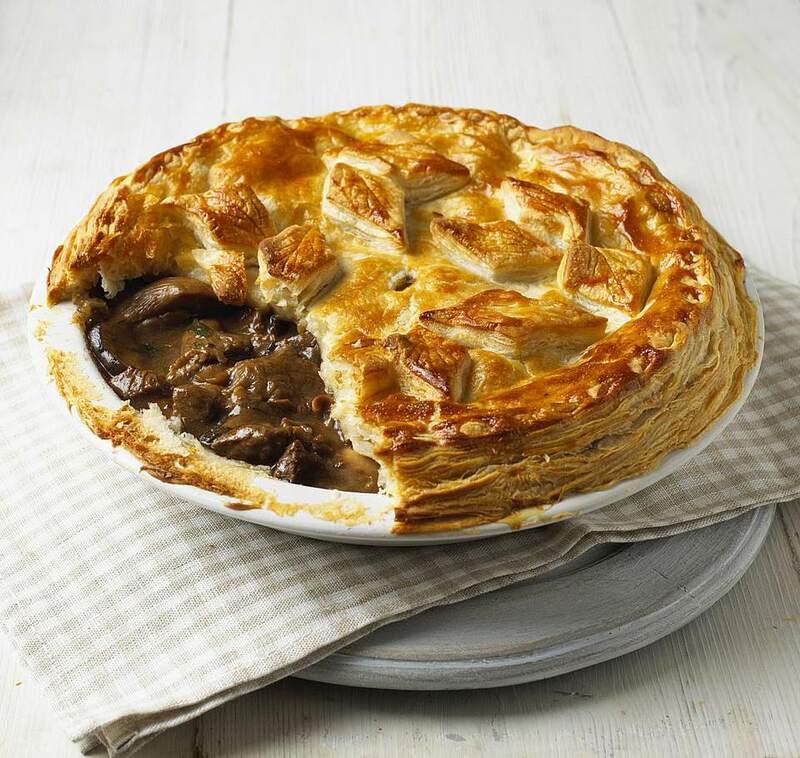 There are pies and there are special pies but Venison Pie is so special. The lean meat belies the richness of the gravy in this pie. The recipe may look a little daunting but do not be put off, it is in fact straightforward. Heat the dripping in a large, lidded casserole on the hob, add the onions, fry until soft and browned. Turn off the heat, sift the flour and mustard powder into the pot. Stir until you have a thickish onion mix. Add the meat and carrots to the onions. Add the ale, sugar, vinegar, nutmeg, thyme and pepper, and both ginger biscuits. Stir once more. Cover the contents of the pot with a circle of neatly cut greaseproof and put the lid on, then cook it in the preheated oven for 1 1/2 hours. When the time is up, add a tablespoon of salt. Transfer the contents of the casserole to a pie dish. Use a deep dish, as a wide shallow one will have the pie crust drooping in the middle, thus becoming soggy. Turn the temperature of the oven up to 400F/200C/Gas 6. Roll your pastry out to a thickness of about ¼"/7mm and lay it over the filling. Leave a slight overhang and crimp the edges with a fork. Paint the top of your pie evenly with the beaten egg and milk. This is the time to fashion any pastry motif appropriate to the occasion and place it on top. Prick a hole in the middle of the pastry. Cook for 40-45 minutes, until the pastry is a rich hazelnut brown. If in doubt, cook a little longer, as pale, soggy pastry is not as pleasing. ""When I’m holed up in the countryside I like to cook as simply as possible, partly because in the most remote village shops asking for cumin or olive oil can get you the same look as wearing a leotard in the high street. The following ingredients shouldn’t raise any eyebrows. Use the shoulder or leg for this recipe as the saddle is too lean and should be kept for cooking rare. I don’t like swamping deer meat in boozy marinades as the taste gets lost. Leave the lid off and make a good stew".